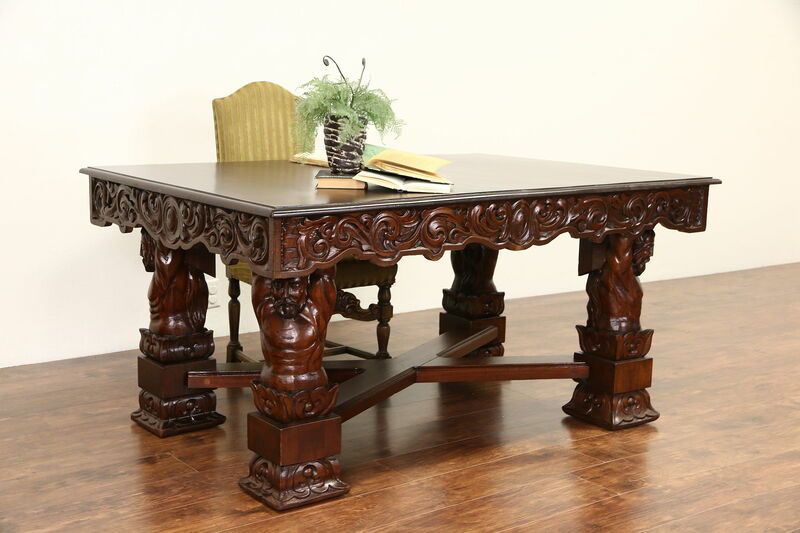 Hand carved in the Renaissance manner in Italy around 1900, a library desk, writing or dining table is solid walnut with a renewed finish in excellent condition preserving patina and some shrinkage cracks, see photos. Three dimensional figural sculptures support the top of this imposing antique European furniture. The trestle base has been reglued to be strong for another generation. Measurements are 63 1/2" long, 45 1/2" wide, 31 1/2" tall and legroom is about 25" underneath. Matching pieces in photos are priced separately, call or email for availability.